Product Description: Disneystrology combines astrology, numerology, and the magic of movies to help readers understand their own personalities. Noted astrologer Lisa Finander has identified 366 unique Disney character types everyone from Snow White to Wall-E and paired these characters to corresponding birth dates. Readers born on November 9, for example, are typically exuberant, friendly, and youthful traits best exemplified by Pinocchio. By contrast, readers born on February 22 are often powerful, principled, and determined the perfect words to describe King Mufasa of The Lion King. Readers will also discover character profiles, compatible birthdays, tips for dealing with others, and much, much more! 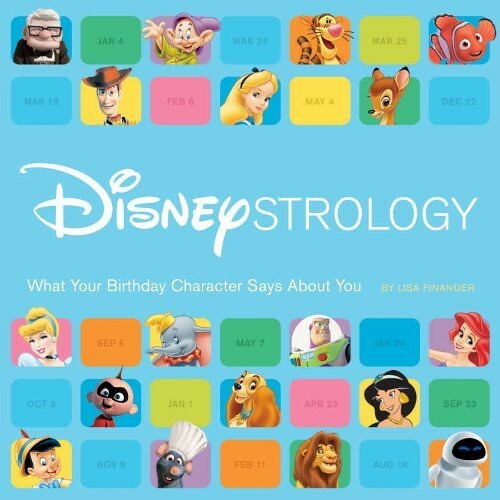 Illustrated with hundreds of stills from more than 90 years of classic animation, Disneystrology is an entertaining tribute to the most delightful characters in movie history. GMD mention: Only four characters are used for four days of the year. I listed them and the dates on a separate page. CLICK HERE if you want to see who got what date. Where can it be purchased: The book can be found online at Amazon.com (paperback version) as well as retail bookstores: Barnes and Noble, Borders, and Bookstar. Copyright © 2010 by Disney Enterprises Inc.